Sun Young Kang, “In Between Presence and Absence,” 2009 (detail). Handmade paper using casting recycled paper. 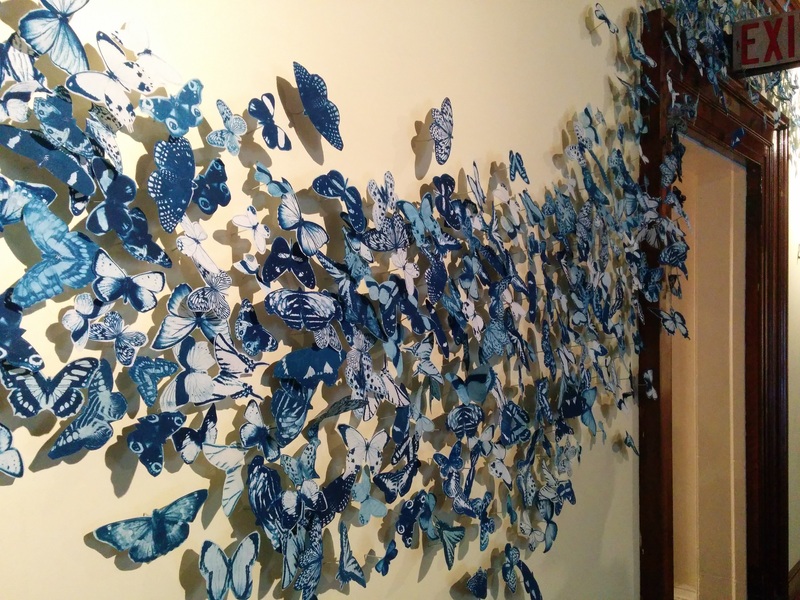 “In Between Presence and Absence” (2009)–the first part of Paperscapes that visitors see when they walk into the Wetherill Mansion. Hundreds of fragile paper vessels fill the entire floor of the gallery, luring you to look closer but simultaneously denying you entry. People hover at the threshold, enthralled and mystified by the paper bottles, cups, mugs, bowls, and vases that almost overflow the room. It’s a work that challenges and confronts you, but in a subtle, understated way–quietly, delicately, much like paper itself. Sun Young Kang, “In Between Presence and Absence,” 2009. Sun Young Kang’s work signals right away the importance of interaction, the give-and-take between a viewer and a work of art, to Paperscapes as a whole. Each artist and installation asks something of us–to listen, to be present, to reflect, or to immerse yourself. These are works of art that flourish in the space between presence and absence, between subject and object, between the “me” of the self and the “you” of the other. Dawn Kramlich, “The Solipsist’s Cell,” 2013. Laser-cut matboard, laser-cut acrylic, fishing line, rubber bristle mats, dual projection. This “me” and “you” is expressed literally in Dawn Kramlich’s work, particularly her two installations on the second floor, “The Solipsist’s Cell” (2013) and “Mind’s Forge” (2013). The two pieces function like mirror images of one another. 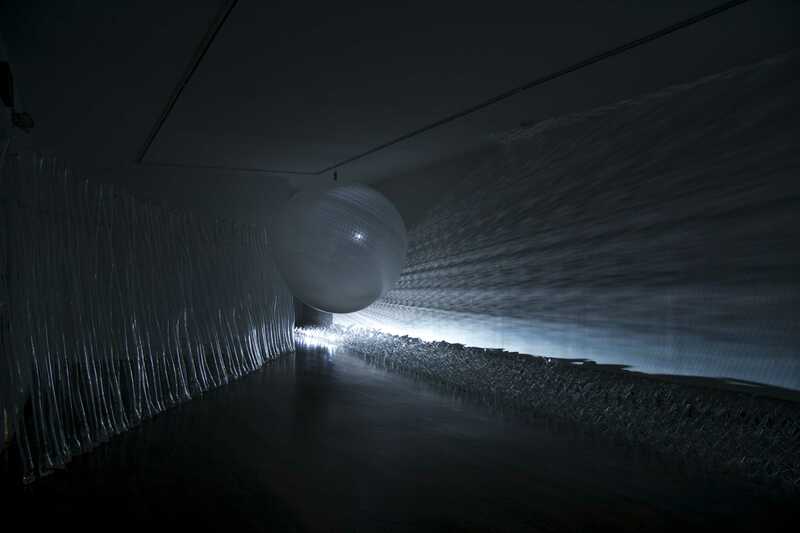 “The Solipsist’s Cell” consists of square panels of black matt board with the same words have been cut out, over and over again–I,” “me,” “you,” “have,” “changed.” These individual panels are suspended with clear monofilament from the ceiling, and form a small cell filled with shadows and light from twin projectors on the east and south walls of the gallery. Dawn Kramlich, “Mind’s Forge,” 2013. Laser-cut matboard. These absent words rematerialize in “Mind’s Forge,” which consists of two groups of black words cut into various sizes piled into heaps and arranged like the twin poles of an hourglass, connected by the most tenuous line of diminutive words. This fragile sense of connection between the two halves of the piece echoes the fragility of our interpersonal connections and the words we use to communicate with one another. Rarely do visitors step over the thin line of words on the floor, but the piece encourages us to be aware of this dividing line that separates the “I” from the “you,” the self from the other. Elizabeth Mackie, “Ortler Kettles #1,” 2015. Abaca paper. Soundscape by Kaitlyn Paston. On the opposite end of the second floor are Elizabeth Mackie’s “Ortler Kettles #1” and “Ortler Kettles” (2015). Although her work is accompanied by a sound installation, these are among the quietest pieces in the whole show, and they reward slow contemplation. Large sheets of handmade paper hang in layers extending out from the wall and into the viewer’s space, up to sixteen layers deep in one case. Irregular, organic shapes have been cut out of each layer of paper, creating topographical maps of positive and negative space. Elizabeth Mackie, “Ortler Kettes,” 2015. Detail. Abaca paper. Mackie’s work is inspired by the Ortler Mountains in the Italian Alps, where glacier loss has radically reshaped the landscape within people’s lifetimes. As you pass in front of her layered panels, you see your shadow reflected on the paper landscapes, reminding all of us the extent to which we are each implicated in the ongoing crisis of global warming. Kaitlyn Paston’s sound installation brings the noise of dripping water into the gallery, where it echoes through the space, spilling out into the rest of the building. Sun Young Kang, “In-Between,” 2014. Strathmore Bristol heavy-weight paper, motion sensor lights. Tucked between the larger galleries with the work of Mackie and Kramlich is Sun Young Kang’s “In-Between” (2014), which consists of myriad pieces of paper rolled into tubes and suspended between the floor and the ceiling. This matter-of-fact description doesn’t do justice to the immersive experience of this installation. Pulling aside a heavy curtain, you walk into a darkened, chilly gallery. As you approach the piece, motion-sensitive lights located beneath the paper tubes light up, throwing dramatic shadows onto the ceiling. This is arguably the single most interactive piece in all of Paperscapes. It is activated by the presence of the viewer, and responds to your movement around the space. Sun Young Kang, “In-Between,” 2013. Detail of shadows on the ceiling. All sorts of enthralling little details become visible in the magical space of the darkened gallery–the light glistening on the clear monofilament from which the paper is suspended, the warm yellow tinge of the paper, the dancing shadows on the ceiling. Kang has created an immersive experience that seems to exist outside of normal time and space, and almost all our visitors have remarked on what an extraordinary installation it is. Moving back downstairs to the first floor, Sue White’s “Encircle” (2017) transforms the domestic interior of the Wetherill Mansion into a sort of deconstructed fairy tale. Paper flower buds with silkscreened leaves wind their way across the walls and windows of the room, parting only around a turret-filled castle in the center of the western wall. The castle is made of small, precisely rolled tubes of paper, the pages of old books whose contents are now illegible. Like Prince Charming in Sleeping Beauty, our attention is focused on the castle in the distance, but in this case, it is truly impregnable, an imaginary castle made of illegible words and fragments. Susan White, “Encircle,” 2017. Detail of silkscreen leaves. White spent weeks cutting paper by hand and affixing it to the walls with wheat paste, a medium used in bookbinding as well as for ephemeral street art. And for all its labor-intensive, involved set up, White’s installation is ultimately ephemeral; its life will be over when all the pieces are stripped from the walls. If you can’t make it by the PAA to check out her work by April 30, you’re in luck, because “Encircle” will remain up until May 15. Catch Paperscapes before the show closes on April 30. The PAA is open Tuesday through Sunday, noon to 6 pm. In Spring of 2007, the Art Alliance hosted “Gravity,” a glass and multimedia installation by Jon Clark and Angus Powers, with sound by Jessie Daniels. Jon recently got in touch with us to pass along the good news that “Gravity” has been acquired by the Bergstrom-Mahler Museum of Glass in Wisconsin. Congratulations, Jon! Check out this short film of the 2007 installation of “Gravity” at the PAA, and be sure to check it out the next time you’re in Wisconsin! Having graduated from the University of the Arts in 2010, Caitlin McCormack has been remarkably productive. Averaging about 25 group and solo shows a year, it’s impressive that McCormack has the time and energy to keep producing her intricate crochet creations. The works on view in A Curious Nature at the PAA were all made within the past year, and they speak the ways that McCormack continues to develop the techniques and themes of her art. In contrast to the rich, glossy coats of Linda Cordell’s glazed porcelain animals, McCormack explores shades of gray, channeling her memories of people and places through the distorted and fantastical crocheted bodies of imaginary creatures. For McCormack, animals function as an intermediary between us and our memories; they take forms that our human bodies cannot, express thoughts and feelings that human voices cannot. While McCormack’s work is deeply personal, her creatures have the power to evoke not only her memories, but ours, as well. Caitlin McCormack, “Bound, As It Were,” 2015. Turning to the right as you enter the gallery are a pair of works–“Bound, As It Were” and “Obligatus”–that incorporate antique crocheted gloves, hinting at the ghostly presence of a woman. Upon learning that McCormack learned to crochet from her late grandmother, I find it hard not to see these gloves as a more specific evocation of loss, and of the function of crochet as an art of memory that is deeply personal. McCormack has been gradually increasing the scale of her work–no mean feat given the intricacy of crochet as a technique. At 36 inches in length (over twice the length of most of her pieces), 2014’s “Kindertide” is both delicate and visceral. The hollow, bird-like bones of McCormack’s other creations here take on a disturbing solidity. There are few stray strings or fragments of found crochet to distract us. We are confronted with the skeleton of a large creature that seems both amphibian and mammalian, crushed beneath the glass. The density of string makes this work appear weighty, a creature of the physical world and not just of memory or imagination. McCormack explained that she counts each thread carefully, and that each repetitive working of the thread is an act of memory, a sort of secular rosary of crochet. The weight of the particular memory represented by “Kindertide” must be heavy indeed. Caitlin McCormack, “Mansion of Prodigies,” 2015. Occupying a niche in the center of the gallery is another large-scale piece, “Mansion of Prodigies.” Consisting of a crocheted skeletal shark atop a chest of drawers, we are invited to interact with the piece, opening and closing its small drawers to peek at the tiny creatures inside. “Mansion of Prodigies” functions like a latter-day version of the cabinets of curiosities of Renaissance Europe, which were encyclopedic collections of scientific, artistic, and historical objects ranging from gemstones and fossils, to art and antiquities. McCormack’s creatures look like unclassified specimens from an unknown land. Pinned down as if to dissect and classify them, the creatures are contained in drawers labelled with cryptic words–“Electra,” “Aurora,” “Titus”–that only hint at the nature of their mysterious contents. For all their intricacy, there’s something cinematic about McCormack’s work, each piece hinting at a larger narrative. The black boxes lined with black velvet look like miniature stage sets, the intricate strands of thread orchestrating the crocheted sculptures like puppets guided by the invisible hands of memory. This is particularly apparent in one of McCormack’s most recent works, which she created for this show–“Loessborne.” A play on words and ideas surrounding sorrow and loss, birth and bearing, we see two tiny figures, one hunched over the other one in an ambiguous pose that could suggest either love or violence. These two figures are framed underneath by a crocheted lace collar, and from above by a web of threads that extend in rigidly straight lines from a single pin. The linear geometry of the string seems to impose an unnatural restraint on the organic, curving forms of the crocheted figures, hinting at a tension not only between the two figures, but between these creatures and their environment or circumstances. While McCormack’s inspiration may come from personal memories, the intricacy of the technique and the ambiguity of the imagery draw us in, creating eerie stage sets for us to populate with our own memories, dreams, and desires. 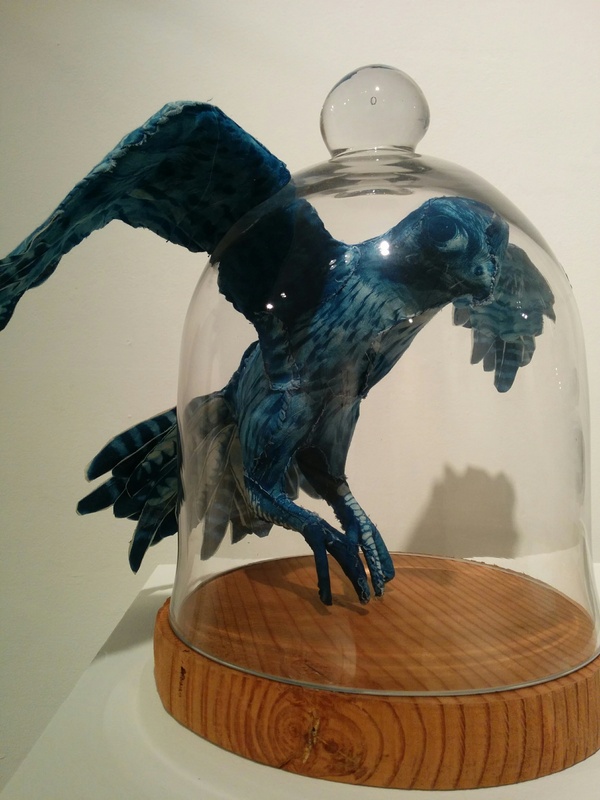 Caitlin McCormack’s work will be on display along with the other creatures of A Curious Nature through December 4, 2016. To read more about her work, check out her website. Liquid and solid, wet and dry, heavy and weightless, funny and frightening–Linda Cordell’s ceramic sculptures occupy a shifting middle ground between each of these binaries. The ten works the artist selected for A Curious Nature offer slightly surreal pairings of porcelain animals, such as dogs, squirrels, and even a bear, with pieces of domestic furniture. Cordell’s demented animal figurines are strangely at home in the setting of the Wetherill Mansion, a former private residence. While I cannot imagine Samuel Wetherill, for whom the mansion was built, owning one of Cordell’s figurines, perhaps he enjoyed the porcelain animal figurines produced by the famous Meissen factory in Germany throughout the late eighteenth and nineteenth centuries, such as this Bolognese terrier made around 1900. 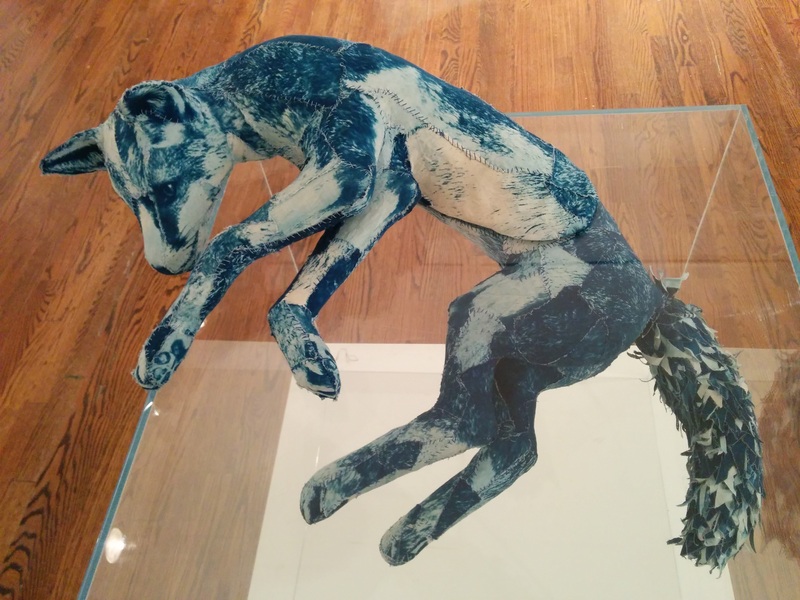 Cordell takes the long tradition of saccharine animal figurines and turns it inside out, exposing the messy reality of animal bodies and the distorting effects of domestication. Figure of a Bolognese Terrier. Made ca. 1900 by the Meissen porcelain factory, Meissen, Germany. Original model by Johann Joachim Kändler, ca. 1750. From the collection of the Philadelphia Museum of Art. 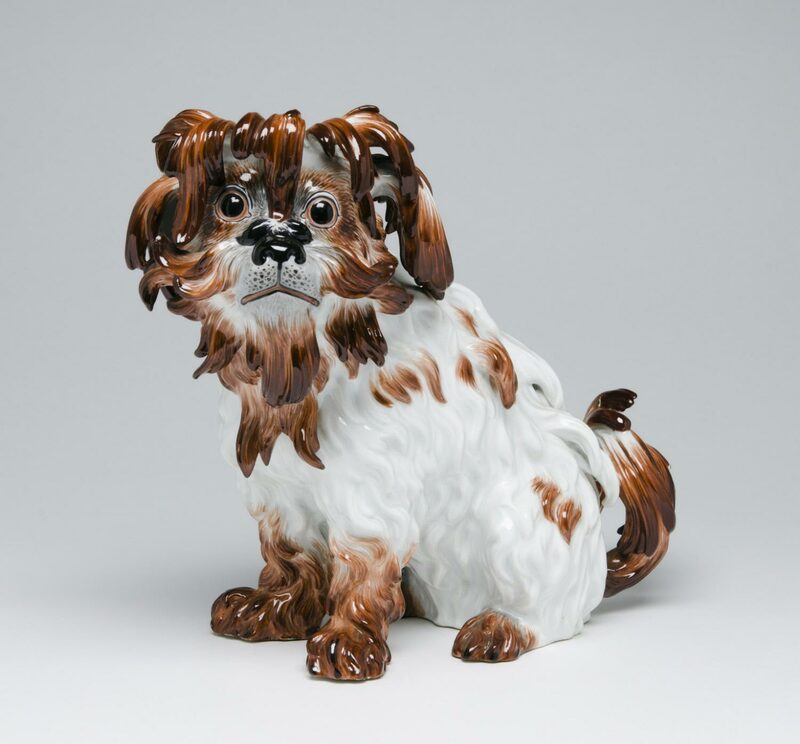 Animals have figured prominently in porcelain production since the early eighteenth century, when porcelain was first produced in Europe in Meissen under the patronage of the Elector Prince of Saxony, Augustus the Strong. Together with more functional items for food service, the Meissen factory produced countless figurines depicting bucolic shepherds and shepherdesses, as well as floppy-eared dogs and other domestic animals. The subject matter of “uncivilized” people and animals contrasted with the precious medium of porcelain, known at the time as “white gold,” and with the abundant wealth and sophistication of the figurines’ owners. These porcelain “noble savages” can be seen as expressions of contemporary Enlightenment philosophical debates about the nature of humankind–are humans naturally depraved, making us little better than animals, as Hobbes would have it, or are we fundamentally moral creatures? While the meaning of what it is to be human has long been expressed through contrast with animals, Cordell’s figurines go beyond this anthropocentrism to suggest the very real effects of this thinking on the bodies of animals themselves. Detail of Linda Cordell, “Slap Dog.” Porcelain, wood, foam, resin, and paint. 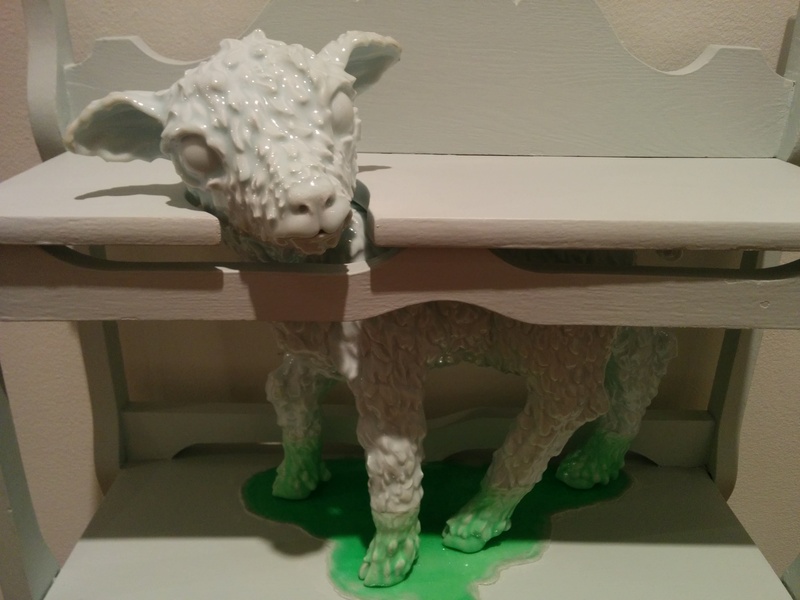 Linda Cordell, “Goat Drip.” Porcelain, wood, foam, resin, paint. 26″ x 28″ x 13″. 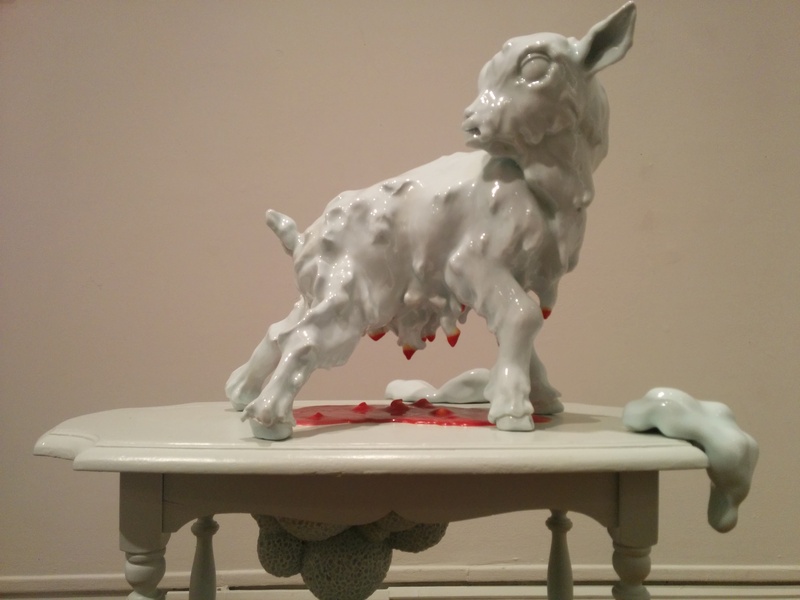 Cordell also incorporates lightweight foam in some of her pieces, such as “Goat Drip.” Reddish colored resin pools on the table underneath the snarling animal, transmuted into bubbling foam as it moves through the wood to beneath the table. The brightly colored enamel strikes a discordant note against the muted white of the furniture and the pale green celadon glaze of the porcelain figures. The ensemble of resin, foam, and porcelain blurs the boundaries between liquid and solid, still subject to gravity and yet resisting it. 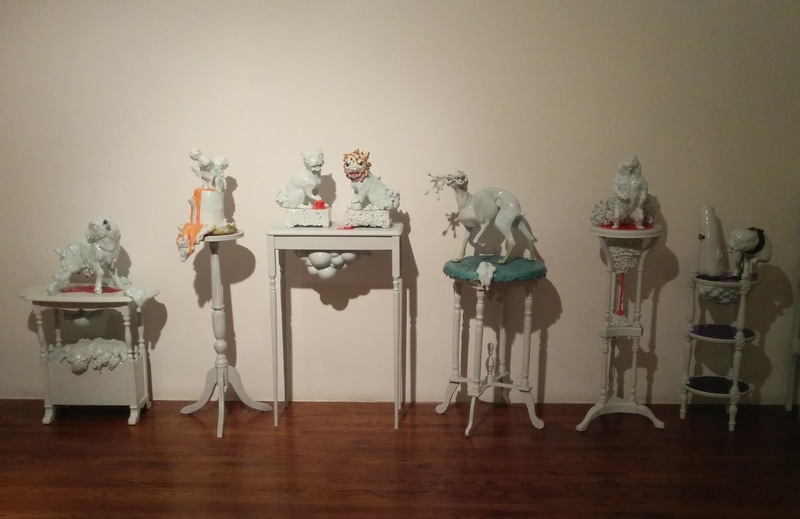 Although the porcelain is the main event, Cordell’s sculptures are multi-media, and the furniture pedestals on which the animals are positioned has been carefully selected and adapted. Unlike traditional frames or pedestals, which aim to be invisible and to focus attention on the work of art, Cordell’s pedestals often overwhelm the porcelain creatures poised atop them–or even caught within them. In one of her more recent works, “Culled Lamb,” the lamb has been positioned inside the shelves, the wood closing around its neck and trapping it. Cordell seems to be drawing attention to the disconnect between human and animal, domestic and wild through the dynamic between the porcelain figure and its pedestal. For all their technical virtuosity, these are not easy works to look at. I feel at once drawn to and repulsed by Cordell’s animals, and they leave me with a lingering sense of discomfort, like being reminded of an inconvenient truth. And perhaps that’s the point. 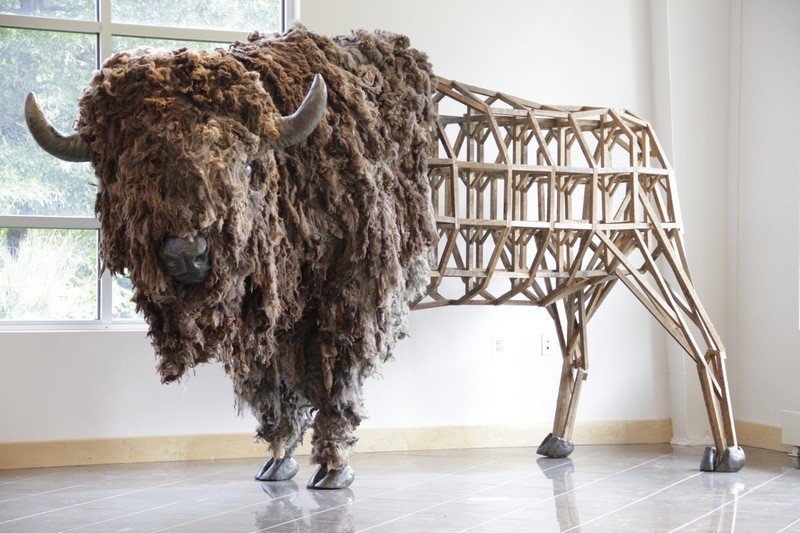 Last week, Emily White’s monumental “American Bison” arrived at the PAA. He’s now happily resting in our downstairs gallery, but his entry into the building was pretty dramatic. Check out these photos, taken by Frank Porras! Come visit “American Bison,” as well as the other critters that are part of A Curious Nature, from October 6–December 4! This fall, some curious creatures are coming to the Art Alliance. Opening October 6, A Curious Nature brings together the work of Linda Cordell, Tasha Lewis, Caitlin McCormack, and Emily White. Using a diverse range of media, these artists explore our relationship with nature through the lens of the animal kingdom. Whether real or imaginary, wild or domestic, animals have long been defined by their interactions with humans, which shape everything from their physical habitats to their symbolic cultural meanings. Together, the artists of A Curious Nature probe the human/animal dichotomy, troubling the traditional anthropocentric understanding of animals that values them solely for their usefulness to people. In the galleries of the PAA, the creatures of A Curious Nature will talk amongst themselves, creating a conversation that spans species and artistic media. If we look and listen closely, we just might learn to appreciate animals in new ways. Emily White, “American Bison,” 2011. Downstairs, sculptor Emily White’s work confronts us with the darker side of human intervention in the natural world: extinction. A monumental bison made of wood and fiber in the central gallery stands in harsh juxtaposition to the fine woodwork and plaster of the Wetherill Mansion, a reminder that the mansion was being built in the early twentieth century, when American bison were being slaughtered in huge numbers. On the ceiling, a flock of now extinct carrier pigeons are frozen in flight. In the front gallery, White’s textile cowhides cleverly play with the craft tradition of quilting and the practice of skinning animals. Moreover, her quilted hides look almost pixellated, drawing attention to the dichotomy of the digital versus the handmade. Upstairs, Linda Cordell, Caitlin McCormack, and Tasha Lewis explore similar themes on a somewhat smaller scale. Cordell’s unorthodox porcelain figurines present domestic animals like dogs not as sweet and harmless ornaments to the home, but rather as oozing, organic, and strangely threatening creatures that seem ill at ease in a domestic setting. 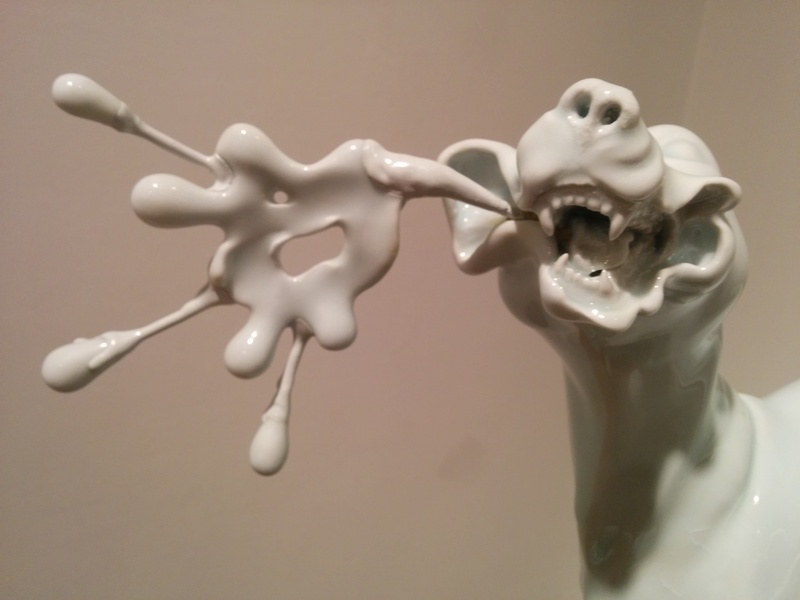 Her porcelain animals bleed, drool, and decay, pushing the boundaries of her ceramic medium and suggesting the negative, distorting effects of domestication upon animals’ bodies. Nearby, McCormack’s crocheted imaginary animal skeletons look like miniature Jabberwockies, fanciful creations that would be at home in any Lewis Carroll tale. 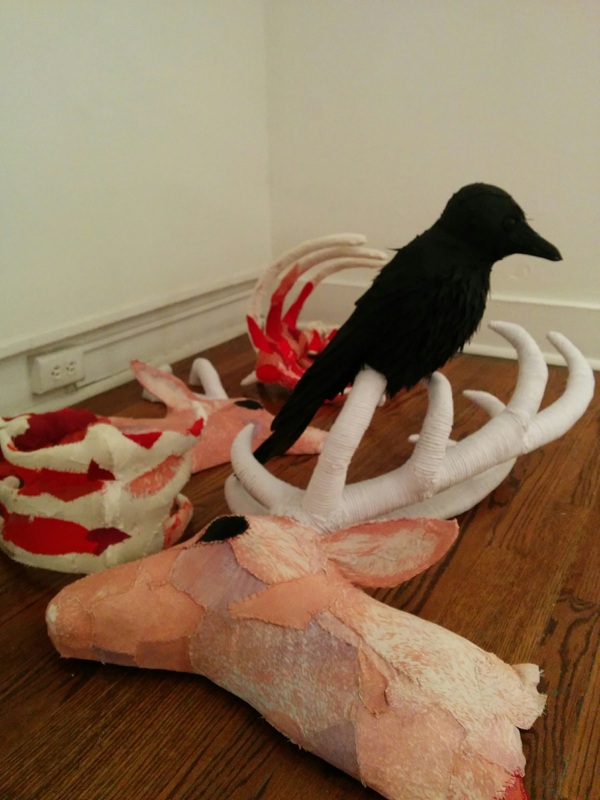 Playfully juxtaposing traditions of taxidermy and crochet, McCormack suggests the limitations of our attempts to understand animals through practices like dissection. Finally, Tasha Lewis’s textile installations of butterflies, bones, and other wildlife likewise reference scientific practices that structure our relationship with animals, such as taxidermy, photography, and museum display. Her fragmentary animal bodies look as though they are emerging out of the wall, giving them an uncanny, lifelike quality. Over the coming weeks, we will be following the artists as they install their work. In the next four posts, we will share our discussions with the artists, as well as our own reflections about the work in A Curious Nature. Stay tuned!